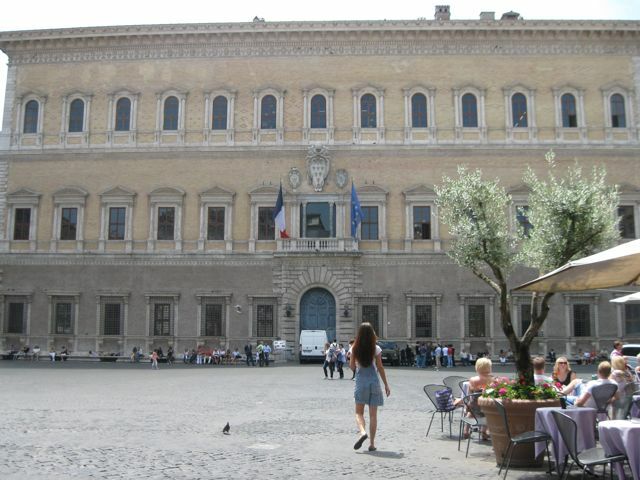 While in Rome, I did what any self-respecting opera fan in Rome does: I took myself on a Tosca walking tour. Here’s what I found. 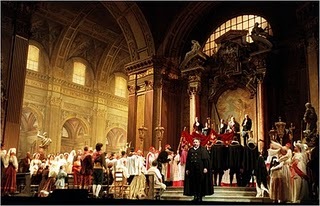 Like most verismic operas, Tosca is specific about details of setting. 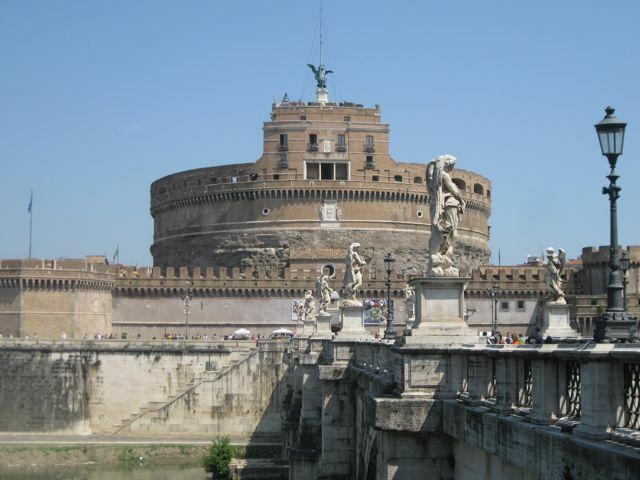 At the beginning of Act 3, Puccini specifies no fewer than fourteen different bells, situated in eight different locations as to aurally render dawn in Rome from the standpoint of the Castel Sant’Angelo. Compared to that, finding the three main sites is easy. You can see these locations in literal-minded action in this movie version of the opera. 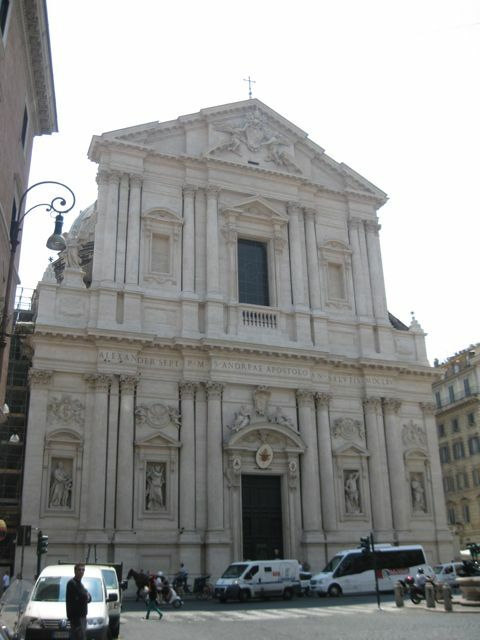 Cavaradossi is doing his painting job at the Baroque basilica of Sant’Andrea della Valle, on the Corso Vittorio Emanuele II and around the corner from the Pantheon. 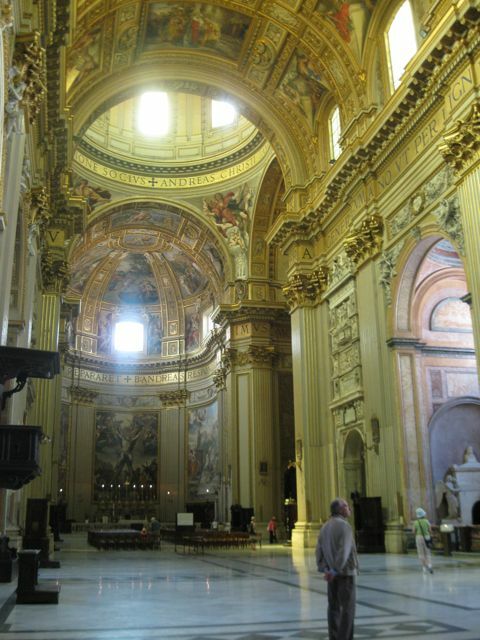 It’s spectacular, but doesn’t rank very high in the food chain of local ecclesiastical tourism, which tells you something about Roman churches (this is possibly because it lacks a defining big-name painting or statue; I guess Cavaradossi doesn’t count). Around a dozen people were milling around when I visited. It boasts lots of frescoes depicting the life of the eponymous St. Andrew and the third-largest dome in Rome (after St. Peter’s and the Pantheon). 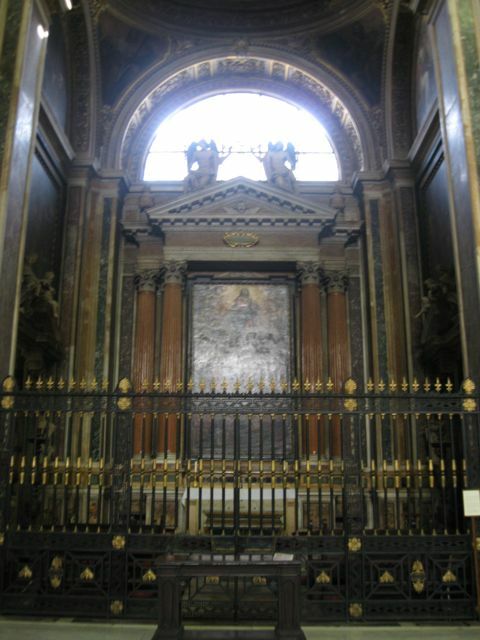 A small sign identifies the chapel dedicated to the Barberini family as the relevant Attavanti chapel. Appropriately, it is enclosed by a locked gate. No lady’s clothes in sight. The art ranges from the sixteenth to nineteenth century. 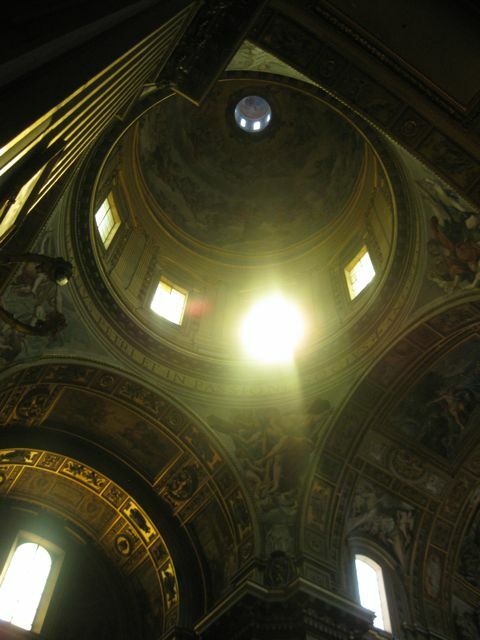 The center of the church is filled with unusual yellow light due to colored windows around the dome, as seen above. Baroque fans should note that there is also a chapel dedicated to the Strozzi family (think Barbara Strozzi). The church is open from 7:30 a.m. until noon and 4:30 to 7:30 in the evening. Here is the set from Franco Zeffirelli’s late Met Tosca prodution. As you can see, he enlarged the church to include (presumably) three vaults to accommodate the size of the Met stage. Shenanigans! 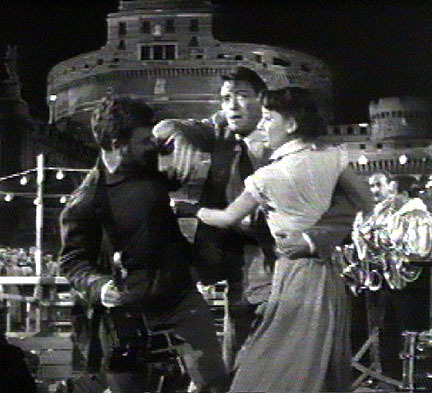 The home of Scarpia’s evil lair is only a five-minute walk away, on the other side of the Campo de’Fiori. Today, in what I’m not sure can be described as dramatic irony or just as strange, it houses the French embassy. You can tour the building if you make an appointment ahead of time, but not being organized, I didn’t, and just admired it from the outside. Too big to fit in one photo! 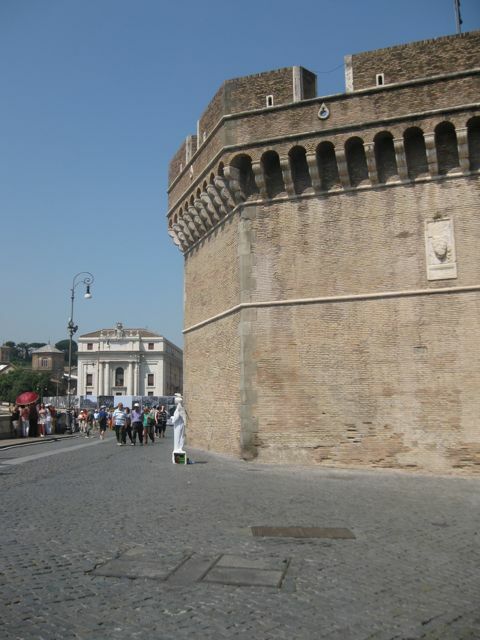 The Castel Sant’Angelo is a major landmark just by dint of its size. 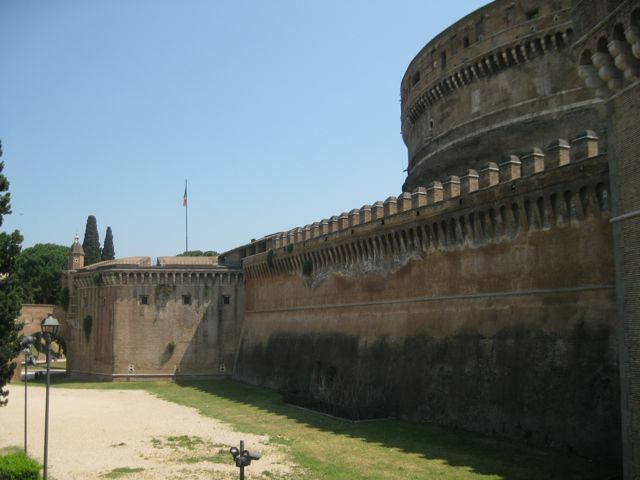 It began life as the mausoleum for the emperor Hadrian but later was expanded into a fortress. 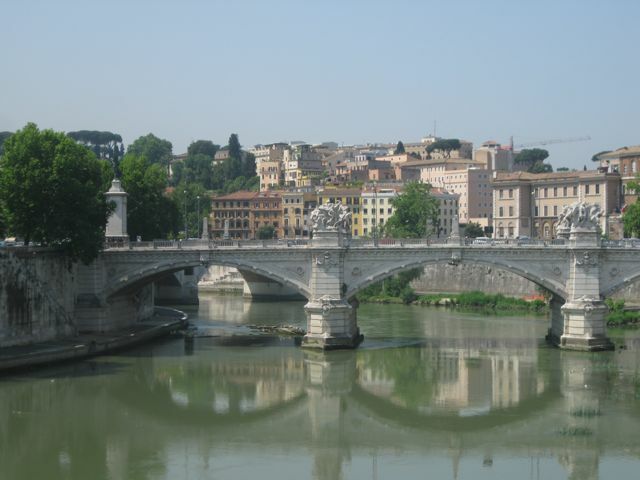 It’s located on the other side of the Tiber, but I really don’t need to give directions. You can’t miss it. Inside it looks quite cute and peaceful today. It houses a not terribly popular museum of miscellaneous objects, but it’s best for just wandering around the battlements. I did wonder: so where did Tosca land? If she landed in the moat (is that what this is? ), maybe she changed her mind and swam away down the river? But pavement of some kind seems more likely. Hopefully she didn’t take a living statue out with her. Her last view, however, was probably gorgeous (for verismic accuracy, I should note that this photo is was taken at around 11:00, not dawn). The location of Mario’s villa, however, remains a secret. Gorgeousity. Why do I live in an icebox? No idea. I kind of loved il Castel. I was in my Yourcenar's Hadrian phase and took a lot of photos of the etched "Animula, vagula, blandula" and all the niches related to him. Lovely photos, this brings back a memory that I did this same thing back in the '80s. 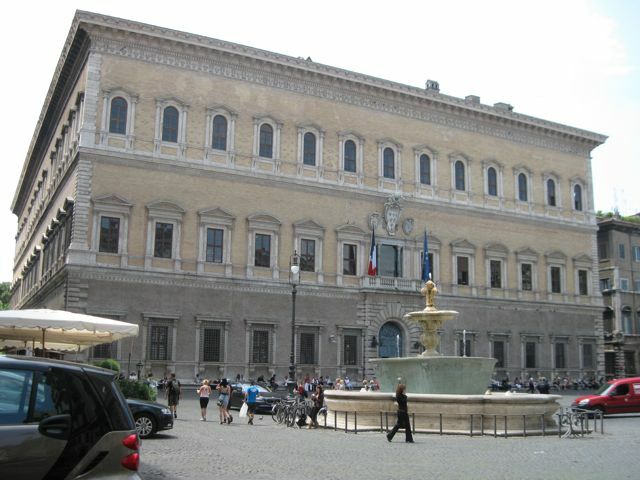 Cops stopped and interrogated me as to why I was snapping pictures of Palazzo Farnese, aka the French Embassy. 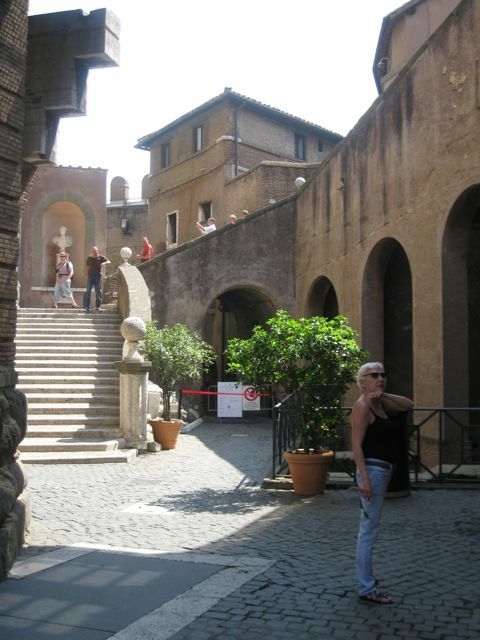 I told them I was on a Tosca walking tour – and after agreeing not to confiscate my film (yes, film then) they slowly followed me in their car (I was on foot, of course) all the way to Castel Sant'Angelo. Scarpia's spirit lives on? Thanks, guys! I love that story, Mirto_P. Maybe they were following you in case you knew the secret location of Cavaradossi's villa. And Def, on the bright side, in your cold climate you probably don't look like a leprous tomato like I do right now. The Italian sun is a powerful thing. "Italy: Even your eye makeup will melt"
Sardou's play is actually quite specific about the location of Mario's villa, and Susan Vandiver Nicassio has plotted everything on a map in her book 'Tosca's Rome'. Great fun for us obsessed opera buffs!